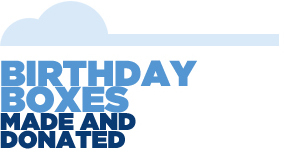 It’s hard for many of us – adults or children – to imagine celebrating a child’s birthday without a party or presents. But for many of the families we serve, finding the extra money to afford a child’s birthday celebration is a struggle at best, and frequently impossible. F-to-F’s Birthday Giving Project is designed to help these families by providing a small “party in a box” for a child in need… and at the same time gives children with “more” the opportunity to learn empathy in a concrete way by helping another child. 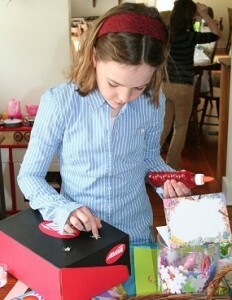 The idea is to decorate and fill shoe boxes or gift bags with everything needed for a small birthday party. Each box goes to a different child. Pick an age (or ages), and choose either boy(s) or girl(s) to send your boxes to. (For example, you might choose a 9-year-old girl, or a 4-year-old boy.) For larger donations multiple ages are best. All items must be new and undamaged. The quality of each box or bag is more important than the quantity, so focus on how to make them extra special! a new ($15-$20) gift for that child. 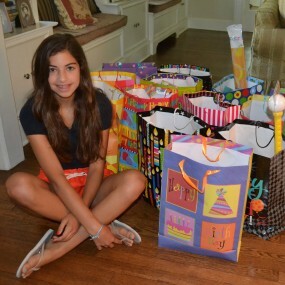 If your child is making the box, he or she can raise the money to buy the birthday items at a bake sale, or yard sale, or by doing extra chores around the house. Wrap the book and the gift in birthday paper. Wrap the top and bottom of the shoe box separately (so that even wrapped, the box can be opened), and fill the wrapped box with the things you have gathered. We can provide you with a list of communities to ship to. You can find a local organization on your own. Please fill out the form below and let us know which option you choose! Here’s how to find an organization near you! We recommend finding an organization before you make the boxes. · Go to a search engine like Google and type in your zip code and a phrase such as “family shelter”, “women’s shelter” or “Boys & Girls Club”. 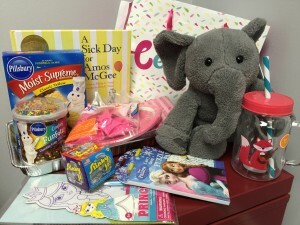 · On shelter websites, take a look at any Wish List provided to make sure they accept all the items in your birthday box. (For example, some shelters can’t accept books or cake fixings.) For Boys & Girls Clubs, you can give them a call or shoot them an email right away! · Once you are connected to the person in charge of donations, give them a brief explanation of what your boxes will contain. Be sure to include the amount of boxes you plan to make, and when you plan to donate them. 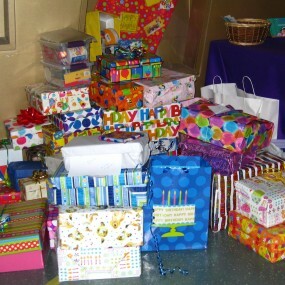 · If you don’t have specific ages or genders in mind for your boxes you can ask what works best for them, or even if there are specific children with birthdays coming up. · Make sure the organization understands that you are dropping off the donation personally, and all they have to do is accept them! If you are making 10 or more we will find you an organization (or two!) in your area. We ask that you make no more than 50 boxes. Please fill out the form below, and someone will get back to you within a few days. If you have any questions send us an email at birthdays@family-to-family.org, we’d be happy to help! on behalf of my company. The Birthday Giving Project may qualify as a community service requirement for your child’s scout troop, school, church or temple. Total since we began: 11,013!